“Hey, Jeff, how about we give you a sendoff before your race?” I got that message over a phone call at the end of the day, right in the midst of “busy.” We all know what busy means…we have too many items to do, but we want to get as many of them done, so we can focus on what is left. It is the same mentality I had when eating dinner as a young boy when the plate contained foods that I don’t like. I would always eat the yucky stuff first, then savor the good stuff. Spinach would get off my plate first, as would green beans. Sweet potatoes and corn would stay on until the end. “Sure, Michael, let’s do it,” was my reply. I saw this moment as one of having more in common with spinach than with sweet potatoes. 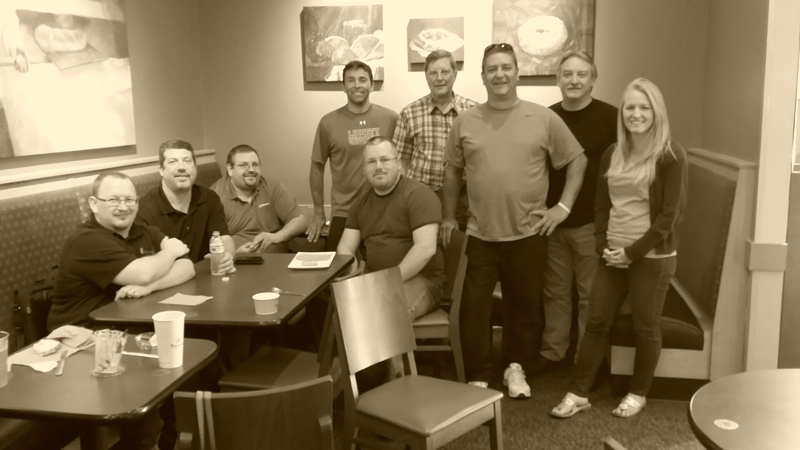 When I finally made it to Panera Bread, many of my company’s NC employees were there, and more kept coming through the doors to meet in the corner of the restaurant. Both the leaders of the engineering division and the sales divisions of my company took a moment to share blessings for me. Dan Whitt put anointed oil on my head and feet, Michael Heath prayed, and others followed. I felt humbled. Before arriving, I viewed this stop as just another item to take care on just another busy day. It never dawned upon me that it would be the most important event of the day. People shared that they were proud of me and they wished me the best. Let’s put this into perspective. I am the president of the company, and the company is growing. In the midst of this growth, I committed to working less and exercising more as I prepare to compete at the World Championship. Instead of choosing to be resentful over their boss’s choice to check out and go “play,” I was lifted up in prayer. Multiple people gave me hugs and told me they loved me. I had just eaten a double order of sweet potatoes, whereas just a few days earlier, I was thinking of this event as more spinach. In fact, when I sat down in the car after I left, I was so touched that I didn’t know where I was going next. I had to open up my phone’s calendar for a reminder. I work at a great company, with great people, who wish me the best. What more can I ask for? Thanks to Gene Choquette for his work ethic and standards. You are truly a professional, and this would not have been doable if you didn’t step up. Thanks to Dan Whitt, for teaching us all how to be Christian at Work, at Play, at Home and everywhere in between. Thanks to Tim and Phillip, for sticking with me, all of these years. Previous postBelieve it or not, I am walking on aer. Very cool post, my friend.